South Korea, 2000 Cor – 112 min. Im Dae-ho (Song) works in a bank and lives with his father. The bank's administration craving for results makes his average day a living hell. His lack of punctuality does not help him either. One day after work he walks by a pro wrestling gym and decides to go in. A fan of the “sport”, eager to learn how to get free from his boss's head-lock, he convinces the owner — a former “star” — to let him train and join competitions. The Foul King is one of the films on which director Kim Ji-in build his reputation of being one of the most interesting authors of modern South Korean cinema. This portrait of a bank clerk becoming a wrestling fighter in his free time was also a major hit in the local box-office in 2000. Song Kang-ho starred in a number of films since the mid-nineties, such as Kim's former work The Quiet Family (1998), following No. 3 (1997) and preceding the mega-hit Swiri (1999). In the first two films Song was just another one amongst a vast cast and in Swiri he played Han Seok-gyu's sidekick policeman. In The Foul King, however, he finally got the opportunity to play the main role, making way to become one of the most important actors working presently in South Korea. Joint Security Area (2000), where the actor plays a North-Korean soldier, would have its premiere a few months later and would turn out to be a major commercial success of a whole other dimension. Although formally a comedy, with some moments of humour that get right on target, The Foul King really intends to be a serious portrait of a desk clerk, diminished at home and at work, which finds an escape in wrestling and also perhaps a kind of armour in this new identity that will enable him to win “out there” in a competitive world where, according to his boss, “only the strong survive”. Dae-so's (Song Kang-ho) life is already troubled enough without coming across street punks. 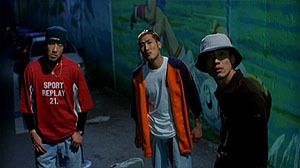 A cameo by Shin Ha-gyun, on the right. A parallel with the universe of super-heroes wouldn't be a coincidence and the chosen “sport” is, in a way, inspired by this: there are the characters, the costumes, the dialogue, and so on. Here the split personality does not work the same way as in super-hero fiction — to protect an identity while the other fights crime —, but Kim still plays around those same concepts, as in the scene where the “hero” decides to come back and confront a gang of teenager punks wearing his combat outfit — an occasion for special appearances by Shin Ha-gyun and Go Ho-gyeong, Mi-na from The Quiet Family. In much the same way, his boss emerges as an archenemy of sorts. Min-yeon (Jang Jin-yeong) also knows some stunts. A fight with Yubiho (Kim Su-ro, from Volcano High). The wrestling fights relevance is rather limited in the narrative. To a certain extent, we feel as though we were watching a film about that sports modality but stepped out without witnessing some of the predictable outcomes. It all turns out to make perfect sense for it is, after all, the character's escape from his normal life. By wearing the costume or assuming the identity of “The Foul King”, Dae-ho may feel his self-confidence and inner strength grow but, on its own, this does not certify that his work and his emotional life will cease to be chaotic. In his skin Song kang-ho gives us a role also quite worthy for its physical component: the actor trained and performed some of the most difficult movements that could have easily had serious consequences. Although not as successful as Kim Ji-un's former and subsequent titles, The Foul King reasserts the director's proficiency on genre cinema, skilfully managing the transition between different languages, from comedy to the sports film, with some moments out of an horror film, by the way he uses the camera and the soundtrack (but, quite remarkably, without ever getting into spoof territory). The sequence labelled as the “horror headlock” seems to send us back to a scene from Ju-on, what could make sense if the Japanese film was not due for its premiere for over two years. (1) The original title has two alternative forms of writing that may be found in the posters, for instance. The last syllable “wang” (“king”) appears in hangeul (왕) and in the matching Chinese character (王). The Chinese character appears either as an extra or as substitute of the Korean. Released in South Korea (Spectrum, R0) in a far from perfect video transfer (compression has some limitations, although the image shows a good definition), found today in the market at a relatively low price. The sound is 5.1 and 2.0. It may also be found in a three film pack, meant to promote South Korean cinema abroad — “The Varied Colors of Korean Cinema” —, released with the support of the Ministry of Culture and Tourism and the Korean Film Commission, which also includes My Heart and Nowhere to Hide. These DVDs should be equal to those sold separately, with the addition of extra subtitles: apart from Korean and English, it also includes Chinese, Japanese, French and Spanish. Latin languages are derived from the English translation, judging from the fact that English names are kept for Korean star names: Go So-yeong, Jeon Do-yeon and Shim Eun-ha appear as Julia Roberts, Demi Moore and Sharon Stone. Extras, where an audio commentary, behind the scenes footage and interviews are included, remain without subtitles. The original limited edition included a reproduction of the mask worn by Song Kang-ho as a swimming cap.